DO NOT FEED BREAD TO BIRDS IN WINTER! A lot of people will scatter bread for winter birds, but bread has very little food value for birds. It fills them up, so they think they have had enough nutrition, and stop foraging for proper food and they can freeze to death with a full stomach. I was told this by a professor of mine who was an ornithologist, not just some guy. 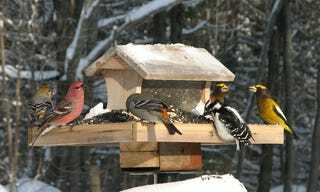 Below are some links with good suggestions for feeding winter bird populations.